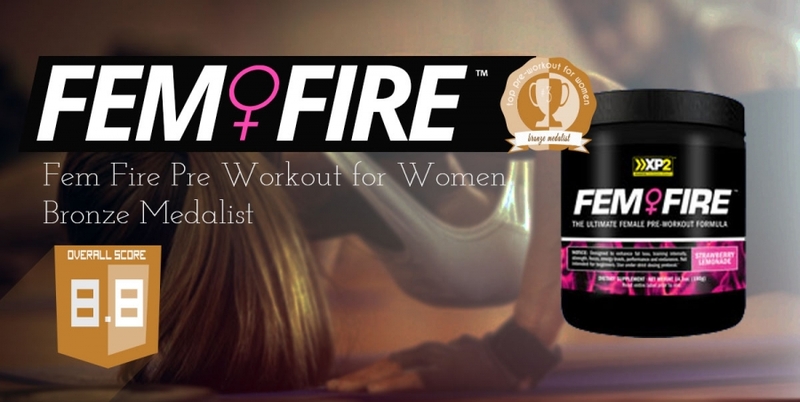 Fem Fire is a new-comer to the pre workout for women scene, and it is one that has already made its mark. XP2 clearly poured tons of thought into this formula, and the 'proof is in the pudding'. The supplement facts panel contains 47 different ingredients. Let that sink in. Forty-seven! That is ridiculous! The 47 ingredients are divided into 6 'mini blends' (more on these later) named 'Lipo-K', 'Peformance' (nice :P), 'Energy and Focus', 'Water Extraction', 'FRC Female Response Complex', and 'CS-Suppress'. You can tell from these names that the focus of this pre workout supplement for women is fat- burning. This being the case, I decided to take Fem Fire before my cycle interval workout. My biking days are when I rev up my metabolism with intervals and really make the focus of the day on fat oxidation. What better time to take Fem Fire? I sampled the strawberry lemonade flavor, which was just average to me, and gave it about 20 minutes to kick in. Around the 15 minute mark I felt a little bit of the beta-alanine tingles, although not to the extent that I did with Fitmiss. I felt really pretty great during my workout- powering through all 12 30 second sprints and feeling good doing it. Ok those last two still are painful, but, you get the point! To this point I think the energy and performance blends performed as advertised. The most noticeable and distinct part of this formula is the 'water extraction' blend. I'm not so sure this is a very practical aspect of product to take prior to exercise- and makes me question the logic behind some of the ingredients. I didn't really notice any marked water extraction, but I did feel a bit dehydrated for the rest of the day. Given the high intensity nature of the workout that I did, the dehydration was to be expected, but Fem Fire may have accentuated the effect. As for the downsides of this product- there are a few. The biggest concern that we had with the product was that it almost seems to have an identity crisis. With forty seven different ingredients in six different categories- who exactly are you, Fem Fire? Are you a pre workout? Are you a fat burner? Are you a pre-bikini-contest de-hydrater? I'm sure the folks at XP2 would eagerly attest: "all of them- in one! ", however, the numbers simply can't support this. The formula weights in at 6 grams, which is in line with the other pre workout drinks. However, with quadruple the number of active ingredients- Fem Fire is spread a little thin. The user just won't get all of those benefits because they couldn't cram much of each ingredient in here! Given those few drawbacks, we did still enjoy our experience with Fem Fire by XP2. Third place is nothing to be ashamed of- and for such a new company and product- it is a great accolade, and something to build on! The product performs nicely in an endurance environment, and may actually contribute some incremental fat burning due to its inclusion of almost every known fat-burning ingredient ever used in any product. ever. How(ever), there's just not enough of each of those ingredients in each scoop to truly be effective. All in all an 8.8 out of 10. Solid!